Is there such a thing as a good bargain tablet? Computer maker Asus (the company that manufactures the awesome Nexus 7) thinks it’s nailed it with its MeMO Pad HD 7. The 7” Android tablet comes with a solid display and decent internals, all for just $150. Let’s start with the screen, an area where the MeMO Pad HD 7 really holds its own. The display has a 1,280 x 800 resolution, noticeably sharper than the 1,024 x 768 iPad mini. You can get better, of course, but it’s a great display for the price. The tablet also comes with 16 GB of storage, putting it on par with its more expensive competition. And the battery is capable of going the distance, too – you get up to 10 hours of use out of a single charge, according to Asus. Naturally, with a less-expensive tablet, not all the hardware is top-of-the-line. The quad-core processor clocks in at 1.2 GHz (compared to the Nexus 7’s 1.5 GHz), and you only get 1 GB of RAM (the Nexus 7 has 2 GB). Of course, if you’re planning to use the device primarily for surfing the web, playing games and watching Netflix, you won’t need more much power than that. The 5 MP rear-facing and 1.2 MP front-facing cameras are similarly adequate. Bottom line: If you can spare the extra $80, you’ll probably be much more satisfied with the sturdier, sexier Nexus 7. But if price is your top concern, you’re going to be hard pressed beating this set of features on a 7" tablet for just $150. 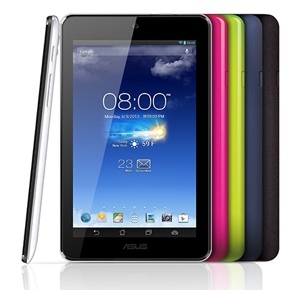 The Asus MeMo Pad HD 7 is available now in five different colors: white, blue, pink, green and gray. The device ships with Android 4.2.1 Jelly Bean.